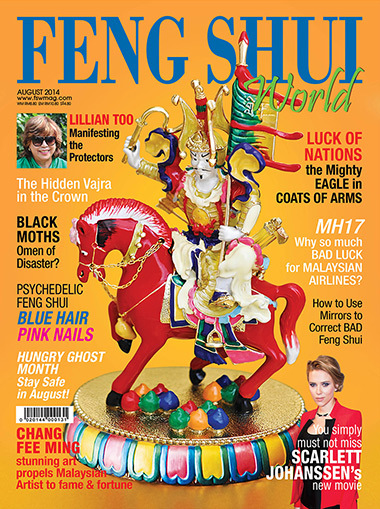 In this issue we feature our irresistible bejewelled statuette of King Gesar of Ling, the most powerful hero of Tibetan legend! He is known as the warrior manifestation of Guru Rinpoche, and the emanation of three lineage Buddhas: Avalokiteshvara, Manjushri and Vajrapani. Inviting him into your home and making regular tea offerings bring extremely swift success in business and careers. He is the ultimate Warrior King who is also an enlightened being. 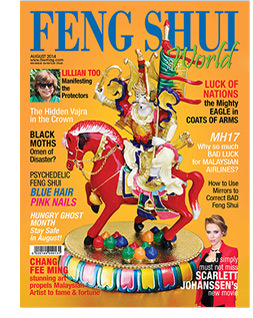 Page 26 : Why is MAS Malaysian Airlines so Unlucky? Page 50 : Giant Black Moths and Butterflies: Good or Bad Omens? 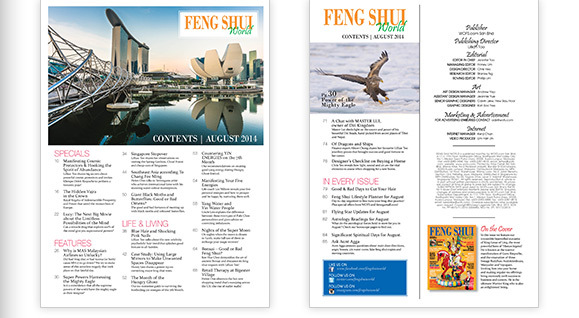 Page 64 : Bonsai – Good or Bad Feng Shui? Page 84 : Significant Spiritual Days for August.